Do you love cereal? I am sure you do, who doesn't. Yesterday Nathan bought ten boxes of cereal for $12, a savings of $40. Although I've encouraged Nathan to create a blog detailing his success with couponing, he is not interested in doing that, so in this post I will try to answers some questions we've received about couponing. Q: Where does Nathan get his coupons? A: The majority of the coupons he uses are from the Sunday paper. In the Sunday paper comes little packs of coupons. One is called the SmartSource the other is the RedPlum. He looks through there and cuts out the coupons that he is interested in, and he has a little accordion-like file he into which organizes them. If he knows a good deal is coming up and he can do major purchase on an item he will order coupons from a clipping service. He uses coupondeded.com for this. Q: Where does Nathan grocery shop? A: For groceries he shops mostly at Ralphs and Vons. Ralphs will double as many coupons as you have up to a dollar. Vons will double two identical coupons up to a dollar. Vons, though they only allow you to double two like coupons, they have the most deals, especially cereal. Q: Does Nathan shop at any drug stores/pharmacies? A: Yes. Nathan does a lot of shopping at CVS and Rite Aid. Q: What is the advantage of shopping at store like this? A: Many of these store have a rewards program. This is where you can actually earn money to spend in the store. Weekly, there will be many items that have money back rewards attach to them, so when you buy these items you earn money. Money that you can spend on anything you want in the store (some restrictions apply). The goal is to find coupons to combine with the items that are offering rewards because this is when you can get an item for free and in some cases earn money. 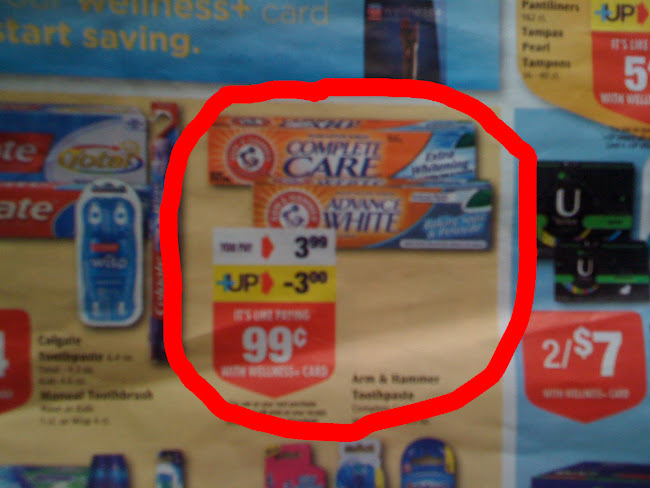 For example, the toothpaste below cost $3.99, but you get $3.00 back, so it's like paying .99 cents for it. But if you have a coupon for .99 cents off that toothpaste it virtually free. You've still paid $3.00 for it, but you will receive $3 to spend in the store at your next purchase (which you can do immediately after in a second transaction if you want). Nathan has earned up to $25 in store credit in one transaction by combining different items that have rewards attached to them. Q: How does Nathan find out when deals are coming? A: He looks in the weekly ads that come in the mail on Tuesday and if he knows he has a coupon for something going on sale he adds it to the shopping list. He also uses online resources. There are people who figure out what deals are coming up. He uses: krazycouponlady.com, iheartcvs.com and iheartriteaid.com. These websites will tell you sales up to a month ahead of time so you can prepare your coupons. p.s. we've just discovered that Target has some great prices on certain items as well, so we may start going there more often too. If you have any questions that I have not answered, leave a comment and I can do a follow up post. Hope this helps. All of that cereal is making me hungry!!! I don't think they double coupons in N California crazy huh? I wish they did! !